Complete the Market-driven Assessment Model questionnaire and receive your customized and personalized copy of the Market-driven Assessment Report today! Why improve an enterprise’s or business unit’s market focus? Exhibit better performance than their rivals. A business is market-oriented or focused when its culture is systematically and entirely committed to the continuous creation of customer value ... this entails collecting and coordinating information on customers, competitors, and other significant market influencers ...it provides a unifying focus for the efforts and projects of the organization, thereby leading to superior performance and a sustainable competitive advantage. What is the Market-driven Assessment Model & Report? The Market-driven Assessment Model & Report was specifically developed to analyze and measure an enterprise’s market orientation or focus. It can be seen as an intelligent web application which measures an enterprise’s or business unit’s Market Focus IQ relative to the four key strategic market performance areas (or 4C’s), i.e. Customer Focus, Company Focus, Competition Focus, and Corporate Strategy Focus. The system then generates a customized report with value-adding strategic marketing information … in order to help you to improve your enterprise's market focus and become more profitable. The model and report was developed by Dawid J. Malherbe. How will the Market-driven Assessment Model and Report benefit me, as a busy executive or entrepreneur? Creative ideas, insights, and vital marketing information that will equip and empower you to guide your enterprise on its way toward an improved market focus! How does the Market-driven Assessment Model work? Corporate Strategy Focus and generates a value-adding personalized and customized report (.pdf) containing strategic insights and advice on how you can improve your enterprise’s or business unit’s market-driveness and market focus! All you have to do is to rate your enterprise’s or business unit’s performance on a scale of 1 to 7 for a total of 21 key statements View example of a question and sub-field description on the FAQ’s page. The Market-driven Assessment Report suggested specific tailor-made strategies to improve the overall marketing performance of our company. The model and report have given us substantial insight into, and very valuable and appropriate recommendations on various aspects of the company's marketing strategy and how to improve on it. The report also recommends strategies and action steps necessary in each of the 4C's key performance areas of your enterprise to ensure growth and improve overall performance! View excerpt of the report on the FAQ’s page. In short, it equips you with vital marketing knowledge and insights necessary to guide your enterprise on its way to an improved market focus. There is currently nothing like this available on the Internet. Order the report now and learn how to direct your organization towards better growth, performance, and profitability! The customized Market-driven Assessment Report that recommends strategies and action steps necessary in each of the 4C’s key market performance areas of my enterprise. The Market Focus IQ scores for each of the 4C's key market performance areas. 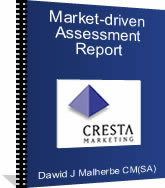 Access to Cresta Marketing’s members' area, where I can download free marketing resources. Above mentioned benefits for only $29.95 US Click for currency converter. I have read the disclaimer and would like to order the Market-driven Assessment Report.